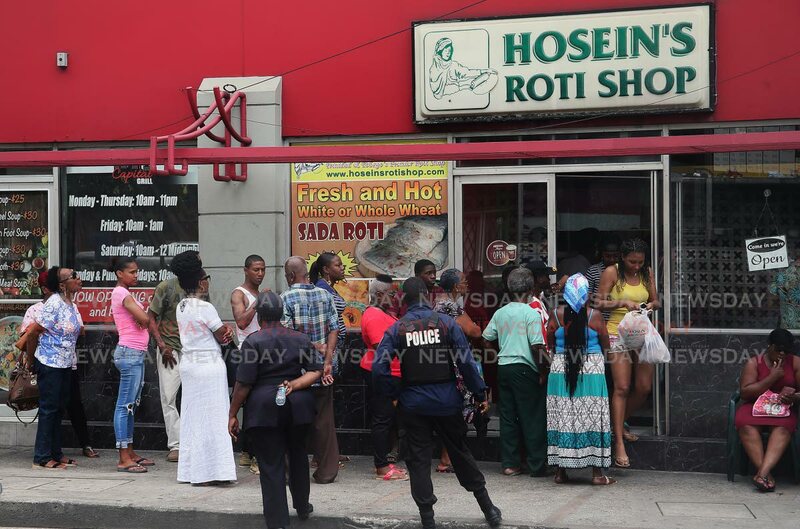 RUSH FOR ROTI: Police officers keep control of a large crowd in line to buy roti from Hosein's Roti Shop on Independence Square, Port of Spain, yesterday. Some lined up from as early at 5.30 am. Roti lovers yesterday willing waited in line for an hour to an hour-and-a-half at roti shops for roti skins to go with their homemade curry for Divali. One woman waiting in line outside Hosein’s Roti Shop on Independence Square, Port of Spain, was less than patient with the wait, pointing out that first, there was a wait to order and pay, then another wait to get the order. She said she was a nurse from Oropune Gardens, Piarco and went to the roti shop as soon as she finished her night shift in Petit Valley yesterday morning, as requested by a family member. “I don’t know how people do this every year! If this buss-up-shot wasn’t for my family I would have gone long time. At this rate I don’t know what time they will get it but I have no choice.” However, others were more tolerant of the wait. An elderly woman from Sea Lots even did it twice. She told Newsday she arrived early for buss-up- shot, walked home to drop off the two heavy bags of roti and returned to buy dhalpuri. She said she had many family members and they ate a lot and she wanted to ensure they were well fed so she was prepared for the walk and the wait. She added that the shop no longer took orders because they could not meet the demand, so patrons had to line up, order on the spot, and wait.